Use for food safety and HACCP procedures. 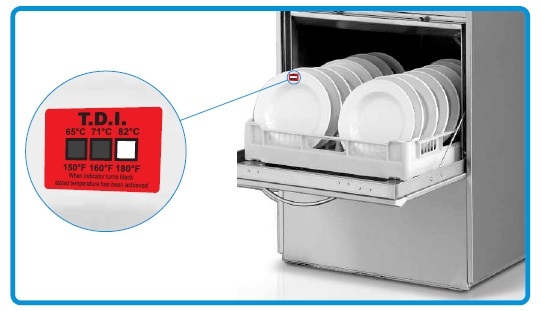 Thermal Disinfection Indicators (TDI) are adhesive labels that are used to identify if the surface of objects that have been cleaned in a dishwasher have reached a temperature high enough that they are sanitised. As part of a thorough Food Safety and HACCP plan, these TDIs verify that disinfection has occured and provide a record as part of good public health and food safety procedure. To use the TDI labels, stick one to an item going into the centre of the dishwasher, such as a plate. Once the dishwasher has run its cycle, read the label. The indicated temperature will have changed from silver to black. Remove the label whilst still warm and attach to a record for verification. The TDI can also be used in medical applications including laundry services. Simply place a TDI inside a small snap-lock bag and through it in the wash cycle - easy! Copyright © 2012 www.measuretech.com.au. All Rights Reserved.